Nintendo of America with a Switch version of the TV ad. 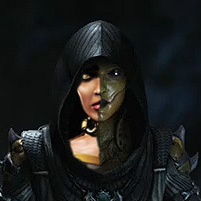 Some differences in there and they even have the actor who helped ruin Scorpion's lore in MK Legacy. They sure did their best to not show any footage of the the game. Is it really that bad? What am I getting myself into? Why do you play it on Switch if you don`t mind me asking? Do you not have a PS4? I only have a Switch. I'm a longtime Nintendo user, you see. I tend to prefer Nintendo consoles over other consoles. As for Kitana: love the outfit, hate the shoes.